Don’t remember this in the movie. 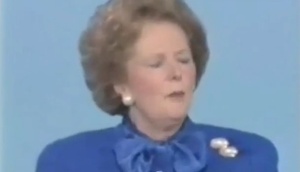 Margaret Thatcher, at the Conservative Party conference in 1987. She had Jimmy Savile around for Christmas that year. Posted in Misc and tagged equality, Margaret Thatcher at 11:26 am on April 15, 2013 by Emily O'Callaghan.